By the time you read this, the Trump administration will have been in power for some weeks. Prior to the inauguration, stock markets rallied in expectation of lower taxes, less regulation, higher defense spending, a possible fiscal stimulus program and, in the case of financial companies, the higher interest rates that all this might cause. Although some of the initial enthusiasm has begun to wane, the market’s embrace of the potential policies of the Trump administration — and a unified Republican Congress — is evident in most sectors of the market. The most notable exception is in the healthcare sector, which is under fire from both parties. Gary Varvel Editorial Cartoon used with the permission of Gary Varvel, garyvarvel.com. All rights reserved. There is risk that the market’s enthusiasm is premature, as much work remains before any of these reforms can be implemented. Furthermore, the “resistance movement” appears to have considerable support, the result of which may be to pre-empt these and other policy changes that, absent the social controversies, might otherwise carry the day. Finally, Trump could squander political capital on immigration reform or other quagmires and lose momentum. Still, it is interesting to examine the promise of reform in some detail, because doing so illuminates the market’s embedded expectations. Several tax proposals are floating around. On the corporate side, there are proposals for lower corporate tax rates, a holiday on the tax on foreign profit repatriation, and immediate deduction for capital investments—all of these seem, for investors, tantalizingly within reach. Corporate tax reform is long overdue. Statutory US corporate tax rates are high by international standards. According to 2014 data from the OECD, the combined federal and state statutory corporate tax rate for the United States is 39.1 percent. The average of the other 33 members of the OECD is 24.8 percent—14.3 percentage points lower than the US rate. IT IS INTERESTING TO EXAMINE THE PROMISE OF REFORM IN SOME DETAIL, BECAUSE DOING SO ILLUMINATES THE MARKET’S EMBEDDED EXPECTATIONS. Of course, the devil is in the details. Competing studies suggest that, taking into account the differences in what is deductible from income in various countries, effective US tax rates are not that much different, or only slightly higher. However, in most other developed countries, a domestic corporation is taxed only on profits earned in the home country. Corporations pay taxes on foreign profits only in (and to) the foreign jurisdictions where the profit is earned. But the U.S. has a “global” or “world-wide” corporate tax scheme that taxes US corporations on all their income, whether earned here or abroad. The tax on foreign earnings is only payable when profits are “repatriated”, or brought back home. Multinational US companies hold an estimated $2.1 trillion of un-repatriated profits abroad, on which no US taxes have yet been paid. The proposal for a repatriation tax holiday—which would lower or eliminate taxes on repatriated earnings—may seem like a corporate giveaway, but only if you believe the system of global taxation is fair to begin with. The new administration, and most Republicans in Congress, does not seem to think so and are working on proposals to scale back the extra cost of global taxation. A previous tax holiday took place in 2004—when the rate was lowered to 5%—though Democrats killed another one proposed in 2009. 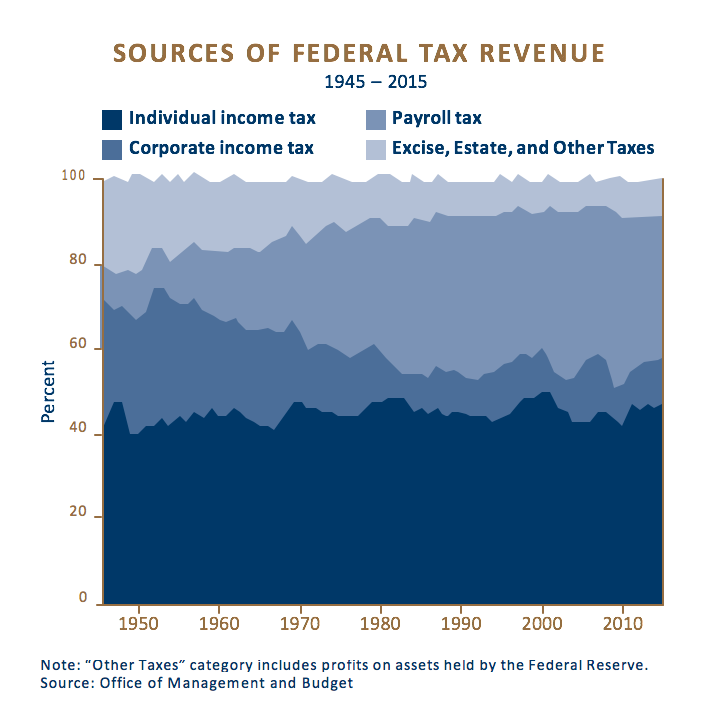 THOUGH CORPORATE TAXATION REPRESENTS A DWINDLING SHARE OF THE FEDERAL REVENUE, THE NUMBERS ARE NOT INSIGNIFICANT. Though corporate taxation represents a dwindling share of federal revenue, the numbers are not insignificant. Since the 1950’s, corporate taxes have fallen from over 30% of federal revenue to 11%.In dollar terms, corporate taxes were $440 billion in 2015. The transfer of a significant portion of these revenues to shareholders via reduced taxation would certainly justify higher valuations for public equities, especially domestically-oriented companies that do not currently benefit from the tax-minimization strategies employed by multinationals. An arcane feature of several circulating tax reform proposals would allow businesses to immediately deduct the cost of capital investments, rather than to spread the deduction over time through the use of annual depreciation schedules. Proponents argue that the measure would be tax neutral over time- the amount of cumulative deduction for capital investment would be the same-but could immediately stimulate new investments by improving near-term cash flow. As a side effect, the proposal would eliminate the differences between how different industries are taxed -energy companies, for example, have preferential investment deduction schemes—and thus make the tax code more fair and transparent. DESPITE THE ECONOMIC RECOVERY, PRIVATE INVESTMENT HAS ONLY JUST RETURNED TO ITS LEVEL PRIOR TO THE GREAT RECESSION. 1.5%, the first decline since 2009. It is not clear that improving the tax climate for capital investment would boost investment spending -other causes may explain it- but it probably would not hurt. On the individual side, the various tax reform proposals are less fundamental. Income tax rates may decline for top earners but at least part of the benefits would be offset by new caps on itemized deductions or by elimination of certain deductions entirely, such as the one for state and local taxes. Estate taxes might be eliminated, but the step-up of cost basis that is currently allowed on inherited assets is also targeted for elimination. Though the prospect of lower taxes, higher investment and greater fairness and transparency is much to be desired, the overall economic impact of any major package of tax reforms will be determined by whether or not law makers seek revenue neutrality. Will the tax system changes result in lower overall revenue for the government (such as the Reagan/Stockman tax cuts) or will the impact be “revenue neutral?” There is general support on both sides of the aisle for revenue neutrality but there remain proponents for reduced government revenue and spending altogether. THE OVERALL ECONOMIC IMPACT OF ANY MAJOR PACKAGE OF TAX REFORMS WILL BE DETERMINED BY WHETHER OR NOT LAW MAKERS SEEK REVENUE NEUTRALITY. Will the tax system changes result in lower overall revenue for the government (such as the Reagan/Stockman tax cuts) or will the impact be “revenue neutral?” There is general support on both sides of the aisle for revenue neutrality but there remain proponents for reduced government revenue and spending altogether. In the past, compromises have been struck that have relied on optimistic assumptions about the effect on growth. The risk, at least to the federal budget deficit, is that lawmakers will over-estimate the impact of pro-growth tax reform and leave the Treasury gasping for funds. UNFORTUNATELY, THERE IS A LOT OF BUREAUCRACY AND RED TAPE INVOLVED IN REDUCING BUREAUCRACY AND RED TAPE. back regulations by requiring that each new regulation be accompanied by the elimination of two others. Significantly, it decrees that regulation will be measured by cost alone and not by taking into account whether the benefits outweigh the costs. Major environmental regulations are particularly costly. A study done by the Obama White House in 2011 found that rules issued by the EPA in the previous decade cost $23-$28 billion. (This study predates the EPA’s Clean Power Plan, which regulates carbon pollution from power plants, that could add considerably to to cost.) The study also found, however, that the benefits exceeded these costs and were thereby justified under the old regime. Here again, however, the devil is in the details, which could blunt or delay much of the intended effect. Some predict the order will create chaos in government agencies tasked with implementing statutory regulation. Most regulation is mandated by Congressional legislation, even if details are left to agencies of the Executive Branch. Undoing existing regulations cannot be done with the swipe of a pen, as the lengthy process required by The Administrative Procedure Act requires a finding that doing so would be beneficial to the public. Unfortunately, there is a lot of bureaucracy and red tape involved in reducing bureaucracy and red tape. On defense spending, the previous administration has already put the US on track to spend around $1 trillion in the next 30 years on new nuclear submarines, bombers and missiles. During the campaign, Trump called for increased defense spending by reversing cuts enacted under the 2013 budget sequester and for major upgrades of our nuclear capability. If there is an ensuing arms race, he pledged to “outmatch them at every pass and outlast them all.” But he has also expressed outrage over the projected cost of the F-35 fighter program and has called for our allies pay “their fair share” of NATO, for example. Undoing the sequester could add $500 billion to defense spending over the next ten years and this is, presumably, what the stock market looked at when it marked up stocks in the defense sector. Both candidates called for increased spending on infrastructure during the Presidential campaign. The Trump team pledged to invest $550 billion in bridges, roads and the like and his aides expressed willingness to increase the national debt to do so. Surprisingly enough, there now seems to be bipartisan consensus over the need for renewal of US infrastructure, even though the government was shut down only a few short years ago in favor of fiscal rectitude. Unfortunately, it is highly unlikely that any of it, even if approved by Congress, could be done this year. More realistically, it would take two to three years before federal funding were available and then trickled down to states, who would actually do the heavy lifting. The legislative challenges could be considerable, given that spending could be linked to regulatory reforms, new forms of public-private partnerships and incentivizing tax credits. Though the US central bank repeatedly called for increased fiscal stimulus during the years following the Great Recession, Chair Janet Yellen has recently said that, since the US economy is near full employment, fiscal stimulus is no longer necessary and perhaps even unwise. The Chair’s position could make Congress less likely to go along. A major wildcard in the Trump administration will be the trade agenda. Unlike the tax reform and spending proposals discussed above, the imposition of tariffs could have direct and immediate impact on economic activity, as well as upon more abstract geopolitical uncertainties. A study performed by the Congressional Joint Economic Committee estimates that the existing trade agreements confer benefits in excess of $10,000 per US household. And while it is probably true, as Trump suggests, that those left behind by globalization have suffered, many more have likely to have benefitted from cheaper imports. How this gets resolved is the essence of politics, but we should not count on what is disadvantageous for most people becoming law. A MAJOR WILDCARD IN THE TRUMP ADMINISTRATION WILL BE THE TRADE AGENDA. Please provide us your thoughts and suggestions, including content ideas, by emailing your portfolio manager or [email protected]. If you would like to receive The HeadInvest Quarterly by email, please subscribe to our newsletter list below.